Stuff and junk from my world view that finds an outlet in written form. My own personal hell shared with you. For your infotainment. All activity is performed without adult supervision. So you're stuck with leftover pasta sauce, out of pasta, or are too tired to cook heres a good one to try. 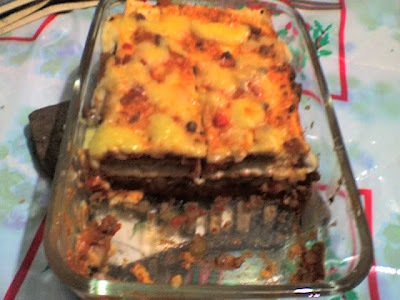 It's just like the "instant"(why they call it this is beyond me it takes 45 minutes in an oven and usually never comes out right)lasagna only lazier and more economical! Here's what you need: Crackers(preferably in onion & chive flavor. Low gluten/high fiber crackers also work well). Pasta sauce, tomato based, your choice. Beschamel sauce / roux. Any melty cheese. To assemble, heat the sauces first then assemble just like regular lasagna. Let it sit for 5 minutes. Then put it in a toaster oven let it "bake" for five minutes,rest for another five minutes then bake again let rest so it sets and thats it, done in a third of the time it takes "instant". Name: Your Enemy and Mine. About me? I'm working on it. My concept of self image or my self awareness is not concrete. The posts in this blog might give you, the reader, insight as to what I am like. Writing it sure has given me more insight as to who I am. Also if you hear rumours. believe half of what you hear and none of what you see. The truth usually comes out stranger. This blog is proudly unsupervised by adults since 2004! I am getting nearer to being a fictional charachter.